Some of the most embarrassing moments of my early years took place in Tagalog class. I sucked at speaking Tagalog. My inability to speak the mother tongue was especially unfortunate during the early hyper-nationalistic years of Martial Law, when quotes from no less than the National Hero, Jose Rizal, were used to rebuke TSL speakers like me. It wasn’t for lack of wanting, but more for lack of opportunity that I was language-challenged. My father was from the northern Luzon province of Ilocos and spoke Ilocano; my mother was from Aklan and spoke Ilonggo/Aklanon. Neither of them cared to learn the other’s language, and because both had grown up under the American-ruled Commonwealth years, they thought English was the best compromise. Consequently I was raised speaking English as my first language. Oh the horror, oh, the shame. By the time I reached grade school, my three siblings and I were so profoundly tongue-tied that my parents hired a private tutor to supplement our Tagalog class. Ms. G. was a nice young woman who came after school to chat with us. I no longer recall what exactly we discussed but whenever she left, I hollered “Paalam, Paalam!” (Goodbye, goodbye!) with equal parts enthusiasm and relief. Despite Ms. G.’s best efforts, Tagalog classes were a weekly exercise in self-flagellation and shame. When our Ms. Fernando, our heavyset Tagalog teacher strolled into the room, I would try to vanish behind the shoulders of the classmate front of me. She had the power to embarrass a hapless student before 45 of her peers and she wielded that power like a female Gandalf. Ms. Fernando’s basso profundo voice carried the gravitas of God. She would start off with a brief lecture on whatever text she had assigned us to read, sometimes asking someone to read a section of it out loud. Then she would move on to a “discussion.” I viewed it more as a hostile interrogation. Every question she put to our class was punctuated with a deep “Hmmmm?” She would scan the classroom and call on the weakest students, the ones who sat hunched over their notebooks trying to disappear behind the person who sat in front of them. Me. I became the unintentional class clown each time Ms. Fernando asked a question I didn’t have sufficient language to answer. I mangled pronunciation, invented words, and got conjugation, pronouns and verbs wrong as the hour was long. My classmates, bless their hearts, thought it was hilarious. Me, not so much. A few years later, our high school class was tasked with staging Jose Rizal’s Noli Me Tangere in classical Tagalog. I didn’t even bother auditioning for the part of Doña Victorina, even though my inner drama queen wept for that part. I settled instead for a backstage job, training the lights on the girl who got the role. Fast forward to California, decades later. I had left my last paper-shuffling job and was seeking a less office-y work situation, when someone suggested telephonic interpretation. It was easy, that person said. All I had to do was pass an oral exam over the phone. I stifled fast rising memories of high school humiliation before they could drown my hopes. Bills needed paying and since this was the only job on the horizon, I had to go for it. When I passed with flying colors, no one was more surprised than me. Somehow, years of chatting and joking in Tagalog with other expatriate Pinoys had diminished my self-consciousness. Practice made (nearly) perfect. Who knew one had to take the girl out of the country to get the country back into the girl? 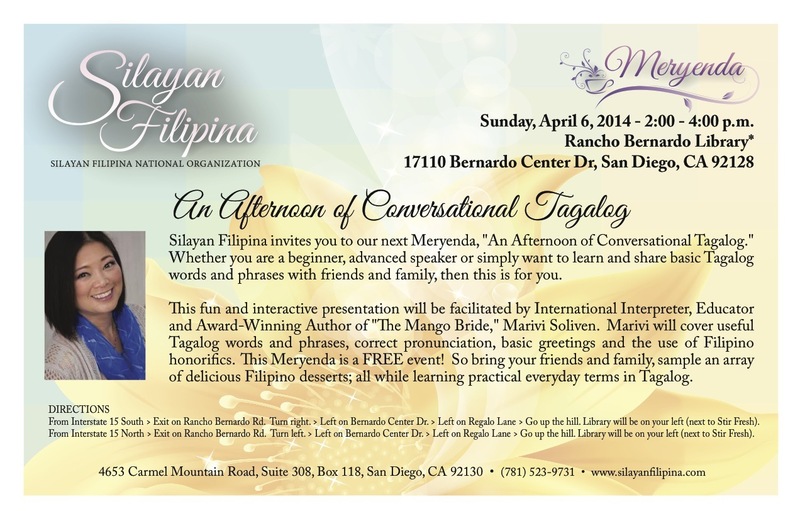 In the oddest twist to this language odyssey I’ve lately agreed to teach conversational Tagalog for Silayan Filipina http://silayanfilipina.com. It took half a lifetime to get from class clown to sage, but the wait was worth it. If only my nemesis, Ms. F. could see me now.